Staged in Lima, the opening ceremony scheduled for Friday 26th July, now less than a year away, the Peruvian Table Tennis Federation is in an advanced state of planning for the 2019 Pan American Games. 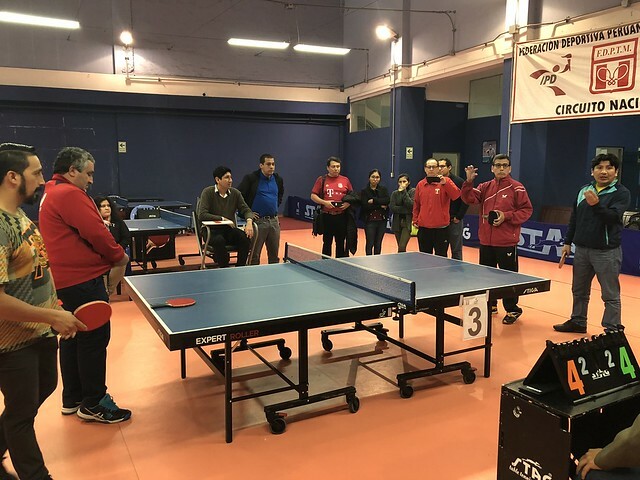 Part of the preparation, administered under the auspices of ITTF High Performance and Development in conjunction with the Latin American Table Tennis Union, was a recent Basic Umpires Course. Conducted by Colombia’s Yoanna Ramirez, proceedings were held in the José Diaz Stadium in Lima on Sunday 29th and Monday 30th July. Overall, a total of 23 umpires from three regions in Peru participated; in addition to Lima, students travelled from Trujillo and Arequipa. All were enthusiastic and willing to learn; none more so than Jorge Chunga Liu, a 35 year old economist. A most positive response; it was the same from Mila Ccasani Paile, medical student who began umpiring one year ago. Similarly, it was a motivated Pedro Mario Padilla Sulca, a 34 year old mathematics graduate who dreams of being able to represent his country in the Pan American Games in Lima in the capacity of international umpire. A successful course, it was very much mission accomplished. Now the national association has a qualified group of officials for the organisation of national, regional and international events, a fact that pleased German Gonzales, the Chair of the Peruvian Table Tennis Federation’s Umpires and Referees Committee. A total of 13 course members achieved the necessary standard to receive the Basic Umpires Award. The participants were: Jorge Chunga Liu, Pedro Mario Padilla Sulca, José Eduardo Bazan Zavaleta, Roger George Tafur Garcia, Cesar Antonio Alvarado Castañeda, Danny Sandro Bernedo Mesia, Rodolfo Tomás Gutarra Mauricio, Jose Baca Fernandez–Baca, Leopoldo Felix Yabar Escribanel, Onan Andrs Encinas Alvarez, Carlos Obando Chavez, Mila Ccasani Paile, Jackeline Jauliz Salvatierrea, Josue Enmanuel Cornelio Paredes, Christian Martín Chilcho Delgado, Fredy Angel Otarola Salazar, Felix Leonardo Garcia Vargas, Arturo Raul Santivañez Portocarrero, Oscar Jose Montoya Lopez, Keyla Mariela Vela Felix, Julio Miguel Chang Ipanaque, Germán Segundo Gonzales Ilizarbe and Cristian Julian Vidal Orcon.